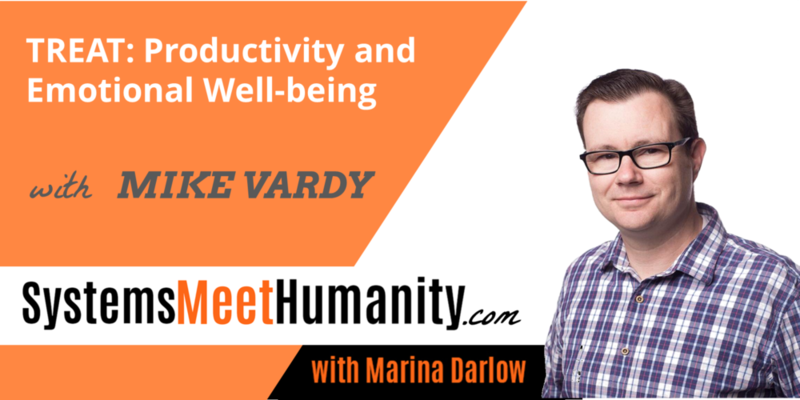 My first ever guest on Systems Meet Humanity is MIKE VARDY! Mike is a writer, a productivity strategist, and the founder of Productivityist, a podcast that routinely tops all kinds of “best productivity podcast” lists. He’s the creator of TimeCrafting, a simple, durable, and flexible personal productivity methodology. Tune into our gem-packed conversation about his TREAT model for personal productivity and emotional well-being. I promise - the TREAT acronym is really fitting. Ultimately, what is TimeCrafting? It’s definitely not a mere set of tools, it’s more of a philosophy. It’s a simple, durable, and flexible way of life to be productive. How to avoid being swept up by our to-do list. Working by mode is the best (and the only effective) way to multitask. Horizontal modes – why and how? Don’t! Use all 5 categories for every task. “All or nothing” approach in weight loss leads to opposite results. Same is true in adopting good systems. Better do it in bite-size chunks. The difference between tools and methodology and how the former is kind of worthless without the latter. Mike Vardy is a writer, productivity strategist, and the founder of Productivityist. He has served as the Managing Editor at Lifehack, and contributed articles on productivity to 99u, Lifehacker, The Next Web, SUCCESS Magazine, The Huffington Post, and more. Mike is also the author of several books, including The Front Nine: How to Start the Year You Want Anytime You Want (published by Diversion Books) and is the creator of TimeCrafting, a simple, durable, and flexible personal productivity methodology - formerly known as The NOW Year Method.